Marriage is challenging. Once the honeymoon is over and real life begins, it can get a little hairy. In our case, we were both young and just starting out with both of us in school as well as working. We were busy, to say the least, and it was so stressful at times! Of course, you’d think we would have been prepared for our share of disagreements. I mean, we only went through 3 sets of premarital counseling. You read that right, THREE!!! First my parent’s pastor, who was also my childhood pastor, wanted to counsel us. Next up was our pastor who wanted to take a shot too. And finally, my grandfather met with us more than once for some counseling sessions since he was to be performing the ceremony. The one thing I took away from counseling was that my husband and I were complete and total opposites in every way. Our pastor said he’d never quite counseled any couple with a personality blend like ours. Our first year was tough. We both matured enough for several lifetimes in that one short year. The one thing we both learned was to listen. Because our personalities are so opposite, we are often coming up with the same solution; however, we arrive at that solution in very different ways. When we finally learned to listen to each other without expectations, preconceived notions, and biases we realized that we were saying the same things. That was a hard lesson to learn! Through the years, we’ve learned to listen more intently, let go of our expectations, and find common ground. We’ve become the best of friends. But we had a few experiences over the past 10 years that tested our relationship. And looking back, I can see God at work in our marriage during those times. Our most recent challenge arrived with the birth of our middle child – little Bee. We didn’t learn for 8 months that she suffered from multiple severe food allergies that were life threatening. When she was about 1 month old I began to suspect that there was something very wrong with her but I had no clear answers. What began as cradle cap progressed into rashes, severe eczema, staph infections, yeast infections, weight loss, and failure to thrive. As parents we were terrified and even though we turned to the doctors for answers, we didn’t get any that were satisfactory. After talking with 15 different doctors in 2 states, we finally received a diagnosis – Bee had at least 10 different allergies and all were classified as life threatening according to her labwork. I had started to suspect food allergies and when I finally had our diagnosis I was so relieved. The relief was short-lived, however, as I struggled to care for Bee, cook for our family, and try to keep her safe. 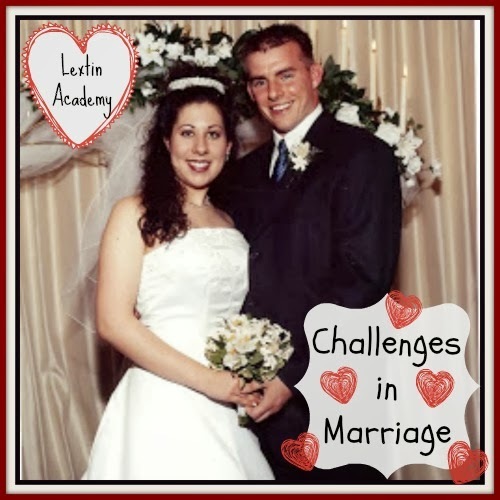 My husband and I each dealt with the news and our new challenges in different ways. He was quietly processing the information and I was lashing out emotionally while we both battled fear and exhaustion. I tried to give him space and not overwhelm him with the information I had learned through all the testing and doctor’s visits. He came home from work every day and took a shift caring for Bee while I took a break. It was a full time job to heal her skin and find meals that she could safely eat. We struggled to keep up with our preschooler, toddler, and new baby while coping with all the changes our family faced. After a few months of trying valiantly to care for everyone’s needs, I cracked. My husband was there to encourage me and we took the time to finally do what we should have done from the beginning. We prayed. We listened. And we stepped out in faith together with a new plan for our family – our entire family would eat allergy free, we would limit all outside activities, and we would focus on Bee’s health. We trusted that God’s plan and knew he entrusted Bee to us for a special reason. We’re still learning about food allergies and it’s a challenge to keep Bee safe. We both battle fear and worry while still trying to maintain our faith. But despite the difficulties, our marriage has grown because this circumstance has reminded us that our marriage is held together not just by love and commitment, but by the One who brought us together in the beginning. Challenges in marriage can easily drive you apart, OR they can be a tool to bring you closer as you choose to rely on Christ together. Our marriage works because we have a 3rd wheel – Christ – who I guess is really more of the axle that keeps us solidly together.